There are parts of London that I know like the back of my hand. Hanover Square in salubrious Mayfair is one. I know every paving stone. I’m on first name terms with every grand oak that lines its garden. You see, I worked here for over a decade when I was a wine buyer. Wine-Journal was essentially born here. Perhaps I should use the past tense, because this Regency square is unrecognizable since we parted ways in 2006, entire buildings demolished or disemboweled to make way for the new Crossrail line. The only features extant since my days here are the trees and the waifs going in and out of the Vogue office. My old office in Mimosa House is now an art gallery and what was a branch of “Thai Square” has recently emerged as “Stem”. Stem is the third restaurant opening for Mark Jarvis following the much-lauded “Anglo” in Clerkenwell and “Neo Bistro” (also in Mayfair). On this showing, just days after its soft launch, “Stem” might well be the best. It is a small restaurant nested in an 18th century, grade two listed townhouse in Princes Street, literally a 30 second stroll from Oxford Circus. The facade is so discrete that I walked straight past it. There are only 35 covers, so it is an intimate setting with Spartan furnishings, clean looking but not sterile, light flooding in from the front window, each side of the room lined with leather banquettes and comfortable wooden chairs. The kitchen itself is tucked downstairs along with a six-seat chef's private table. Head chef, Sam Ashton-Booth has transferred from Anglo, so the menu is unsurprisingly similar, based around modern seasonal British cuisine. The focus on fresh ingredients, light seasoning and judging by the tasting menu that we wisely opted for, dishes that will not leave you feeling fulfilled but not bloated or worrying about the calorie intake. Having dined at Anglo a couple of times, I was already impressed by Ashton-Booth’s cooking, however, Stem takes it to another level. 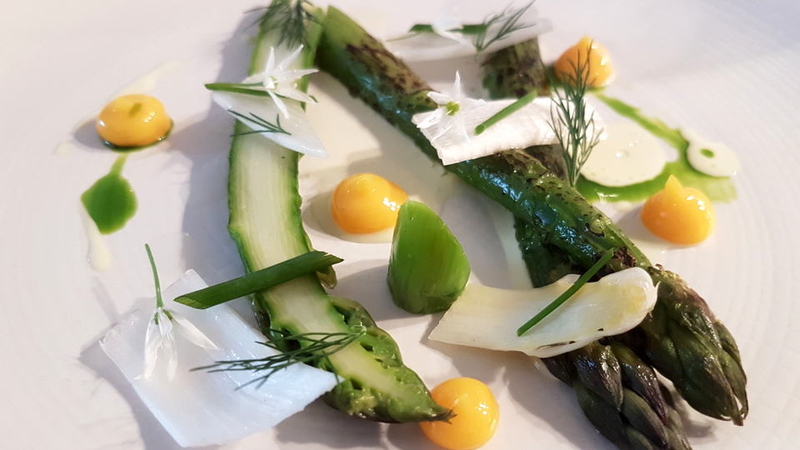 After the sourdough bread with smoked butter and a mouth-watering amuse-bouche, a kind of pop-it-in-your-mouth pea tartlet, the first official dish was new season asparagus. I am not a massive asparagus fan, but these were tender as they come, with tarragon cream neatly offsetting any bitterness and globules of egg yolk complementing the vegetable perfectly. The smoked chicken tortellini with leek hearts was bloody gorgeous, not least the consume that begged to be spooned to the very last drop. The fermented radicchio with blood orange was simple but very effective, the bitterness astutely judged and cleansing the taste buds to ready for the following courses. We skipped the optional turbot and headed straight to the aged sirloin beef with picked shiso and cucumber with bone marrow. The beef was small but cooked to perfection and perfectly seasoned by the bone marrow. Perhaps I would have partnered the beef with something other than cucumber. I am cucumber’s number one fan, but I would have preferred perhaps some new potatoes or spinach, watercress with a light vinaigrette. It was the one combination that did not quite gel for me. 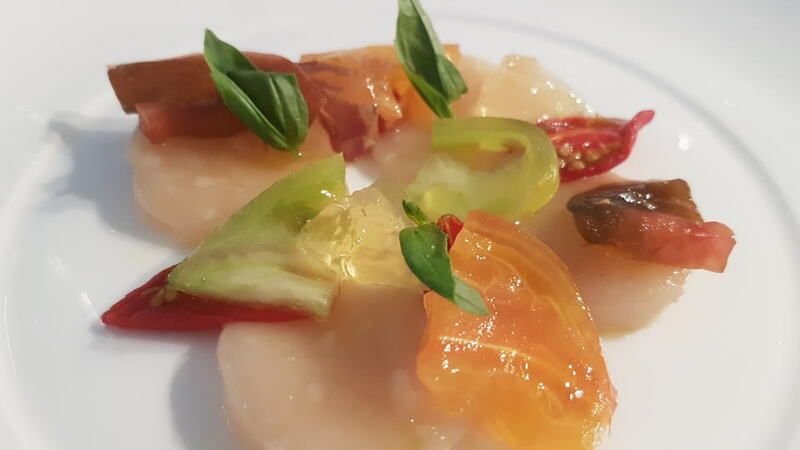 The highlight was unquestionably the raw scallop with heirloom tomato and orange. Wow. It was a sensational combination and the accompanying tomato broth was to die for. 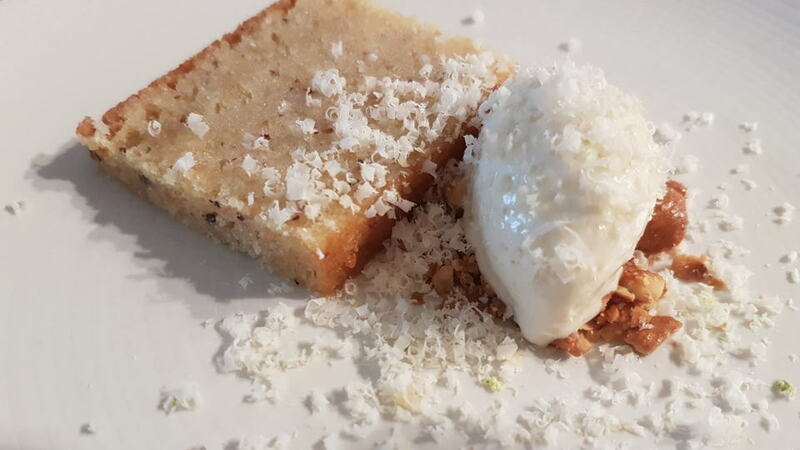 The cheeses were exceptional, all sourced from the excellent “La Fromagerie”, whilst the gooey hazelnut cake with ice cream and flakes of coconut was heavenly. We were allowed corkage. Having regaled English sparkling wine to Antonio the previous day, it was only right that we chose a bottle of Non-Vintage Wiston Brut to commence. Wiston is one of the UK’s best producers and their sparklers genuinely give champagne a run for their money (and I write that as a person that criticized the category for many years). This equal blend of Pinot Noir, Pinot Meunier and Chardonnay was on form, perhaps even better than the bottle I tasted last year, brimming over with Granny Smith apples and a welcome twist of bitter lemon on the finish. The 2014 Old Vine Chenin Blanc from Chris and Andrea Mullineux was served blind. I veered towards a Rhône-inspired white from “Au Bon Climat” instead of Swartland in South Africa. I lauded this wine upon release and this totally vindicated my previous review: just a wonderful expression of the Cape’s signature white grape variety with a seductive, almost waxy texture with hints of almond and Mont Blanc (chestnut cream cake) that leaves you utterly seduced. The NV Trilogie was a fantastic wine, a blend of three vintages of declassified fruit from Le Pin. There are two or three different blends, this one comprising 2013, 2014 and 2015. Again, served blind, I stupidly guessed Saint-Émilion! I know that Jacques Thienpont and Fiona Morrison dislike the speculation that shrouds Trilogie due to its connection. Affordability was their original intention, but you cannot fight market forces and the truth is that this is a delicious, surprisingly complex multi-vintage blend. As one of the only people that ever tasted the declassified 2013 Le Pin, serving as a guinea pig for Jacques on one visit, I can vouchsafe that he made far better use of the fruit that year. The 1975 Ducru Beaucaillou is a vintage that I had not encountered for 15 years but my God, what a wonderful wine! 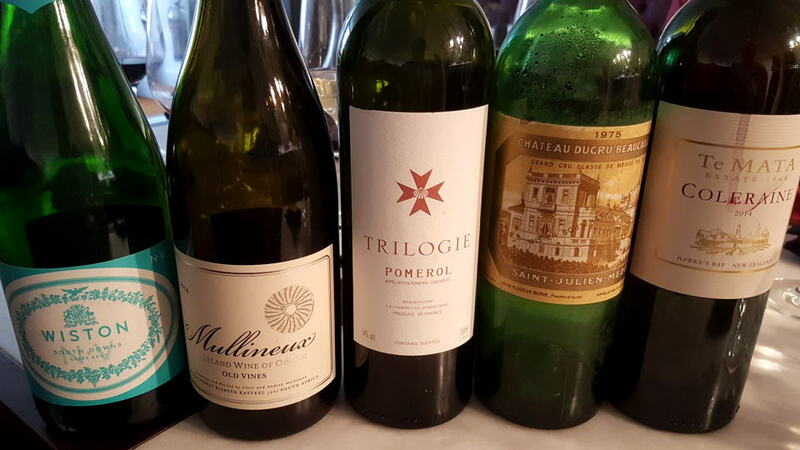 Surely the best between 1970 and 1982, the 1975 is beautifully balanced with ample fruit on the quite precocious nose that is more akin to a 1982 or 1985. Certainly unlike some of its more esteemed counterparts, this 1975 shows no signs of drying out or hard tannins, one of the best I have encountered for some time. Finally, a 2014 Coleraine from Te Mata in New Zealand, still very young but sporting fresh, pure red fruit on the nose and primal, sappy redcurrant and strawberry on the palate that obviously needs another two or three years. All in all, this was an excellent Friday lunch with two old mates. “Stem” has only just opened its doors but on this showing, it is a very welcome addition to the Mayfair restaurant scene. At sixty quid for a 5-course tasting menu, prices are reasonable for this area and it more than delivers on the plate, the wine list well chosen like at Anglo. With Bonham’s Restaurant around the corner, this section of Mayfair seems to be attracting young chefs at bijou restaurants that eschew the stuffiness that surrounds some of its stalwart names and private dining clubs. Mayfair has always been one of the most posh postcodes in London, but now you can eat here and not pay through the nose for an excellent lunch or dinner.